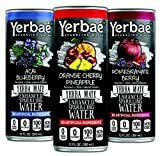 Yerbaé Sparkling Water is a yerba mate enhanced soft drink. In addition to the yerba mate, Yerbaé also contains guarana and white tea as natural sources for its caffeine content. There are two versions: A calorie-free version that has 100 mg of caffeine and a 10-calorie version of Yerbaé that has 125 mg of caffeine per can. All calorie-free flavors have the same amount of caffeine per can. All 10-calorie flavors have the same caffeine content. Yerbaé Sparkling Water is intended for healthy adults only and isn't suitable for children like other sparkling waters might be. Carbonated Water, Natural Flavors, Citric Acid, Proprietary Blend (Yerba Mate, White Tea Extract, Guarana Seed Extract) & Caffeine. Yerbae Sparkling Water contains 8.33 mgs of caffeine per fluid ounce (28.18mg/100 ml).